This roasted broccolini is served with tahini yogurt and charred lemons. It's a healthy, easy to make and super tasty side dish. You will LOVE it! This roasted broccolini will change your life. Whoa … I know that's a big statement, but I believe it's true. You see, I'm normally not a broccoli or broccolini fan. I don't mind it raw and dipped in ranch dressing (so glamorous, I know) but there's something about cooked anything that resembles broccoli that just doesn't do it for me. It's how the end bits get kinda soggy. They're not my thing. Usually. But this is different. The end bits, instead of getting soggy, are crispy and lightly charred. Rather than being their normal bland self they've been transformed into delicious bundles of flavour. Basically, they rock. The roasted broccolini served with a super easy to make tahini yogurt sauce and some tasty charred lemons. I've served these to guests who've raved about them. I've also served these alongside some fish for an easy weeknight meal. Promise me you'll make them? Make sure you don't crowd the pan! This is important to remember anytime you're roasting veggies. If you try to pack too any vegetables on a pan they will steam rather than roast. What you want is crispy, roasted broccolini, not soggy, steamed broccolini. Don't skimp on the oil. The oil helps crisp the florets and bring out the flavour. Same thing with salt. Don't skip it and, whatever you do, don't use the cheap stuff. Boxed salt should be reserved for cleaning, seriously. I like to char the lemons first in a pan as they get a better colour and flavour. To save time you can always skip this step and simply roast them with the broccolini. Instead of broccolini you can substitute broccoli or even rapini. So why do these guys have so many names? Broccolini is also commonly sold as broccolette, broccoletti and (according to Wiki) asparation, asparations and bimi. Whatever you call it, if you roast it this way, it's delicious. 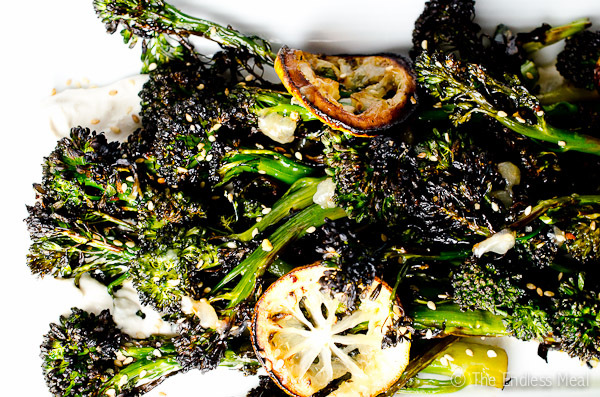 This roasted broccolini is served with tahini yogurt and charred lemons. It's a healthy and super tasty side dish. You will LOVE it! Preheat your oven to broil. Set the oven rack in the top 1/3 of the oven. Place the broccolini on a rimmed baking sheet, making sure not to crowd the pan. Drizzle the oil over top, concentrating on the florets. Lay the lemon slices on the baking sheet and sprinkle the chili flakes and sea salt over top of everything. 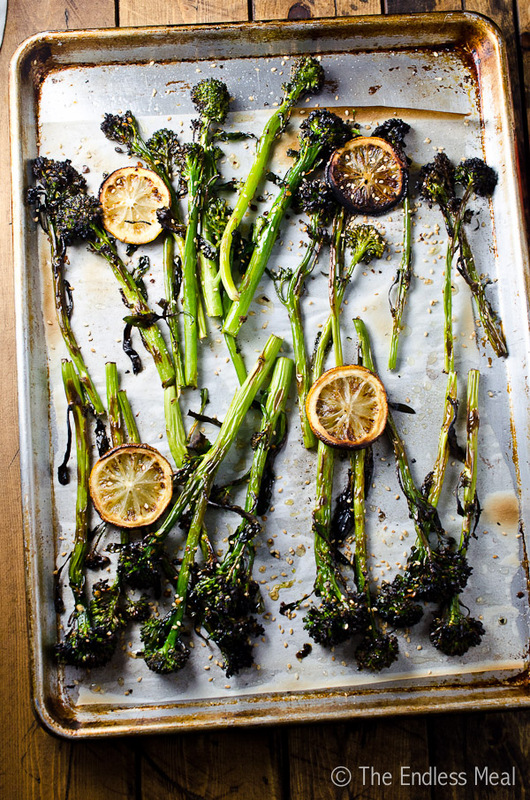 Broil for 10-12 minutes, turning halfway, or until the broccolini florets are crispy, and many are charred. While the broccolini is in the oven, prepare the tahini yogurt sauce. In a small bowl mix the yogurt, tahini, maple syrup, garlic and sea salt. Spread the tahini yogurt sauce on a serving dish. (If you'd prefer you could add a little water to the sauce then pour it over the broccolini instead.) 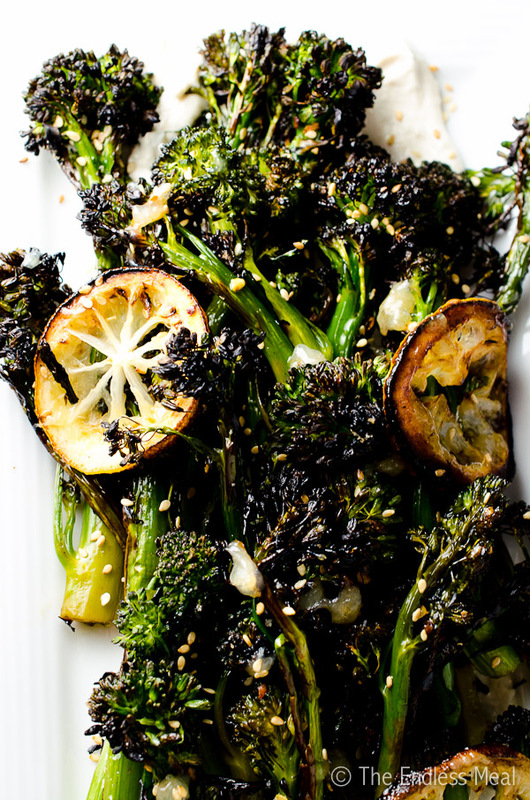 Top with the roasted broccolini and sprinkle with sesame seeds. Using tongs, squeeze the juice from the charred lemons over the broccolini then serve immediately with the reserved lemon on the side. I wanted to bring up one thing though. It’s harmful to eat olive oil that has been heated to higher than 375º. Also, cooking it at a high heat causes extreme smoke in the kitchen. I added my olive oil after I broiled the broccolini, then placed the broccolini back in the oven after it cooled to below 400º. I’ve actually never found that the oil smokes when I roast veggies. Hmmmm … I wonder why not? I’m happy to hear you found a work around that worked for you! I’m confused about where the lemons come in. You mention charring them stovetop. Did you mean to say to do that before adding them under the broiler with the broccolini? Also, Do you think preseved lemons would work here? That is confusing! I’ve corrected the recipe to say to add the lemons to the pan with the broccolini. Thank you for pointing that out! Oh gosh this broccolini dish looks amazing! I totally believe you when you say it’s ife changing – I have to make it. Okay, these were just ridiculously good! I served them with a Moroccan spiced chicken and garlic/lemon mashed potatoes. And here’s something different: I roasted the garlic inside a juiced lemon, using some of the garlic in the potatoes and then squeezing in the roasted lemon pulp. Honestly , it was great. But back to your broccolini – this is definitely becoming a staple in our house and I can’t wait to share the recipe! Ha! I felt like I was reading my own post when I read this. I make one with olive oil, lemon and parmesan and I call it “Magic Broccoli”….it is ridiculously good. Ridiculously! So I totally “get” this recipe. I’m obsessed with Tahini so actually, this takes it to another level!